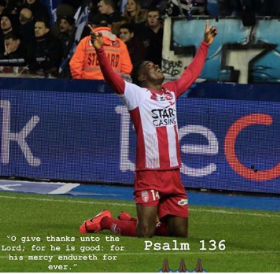 Liverpool loanee Taiwo Awoniyi continued his fine form for his new employer Royal Excel Mouscron after finding the net in their 2-1 win at Gent in a Belgian First Division match on Sunday night. Most of the talk in the buildup to the match involved the Nigeria U23 international's return to the GHELAMCO-arena (Gent), where he spent the first half of the 2018-2019 campaign. The visitors took the lead two minutes before the interval when Awoniyi headed home, assisted by Manuel Benson Hedilazio. Five minutes after the restart, Sidney Friede doubled the advantage before Dylan Bronn halved the deficit when he converted a spot kick on the hour mark. with his strike against Gent his third in four appearances, same number of goals he netted in 22 matches for Gent before his loan deal was terminated. The win against Gent leaves Royal Excel Mouscron in the tenth position with 29 points after 25 rounds in the Belgian top division.